Let me introduce our new family member... our chatty kitty cat named Nibbler. We picked him up from Stephan's sister and brought him home after a 4 hour long drive yesterday. After almost one and a half days in his new home, he slowly gets accustomed to us and our apartment. With his 10 weeks, he sleeps alot (almost 20 hours per day) and in the meantime he wants our full attention, jumping around like a little whirlwind playing with his fishing rod (its feather scrub is in the picture above). Wow, this weekend was hot! The temperatures climbed up to almost 40°C! This makes even normal breathing to a sweaty event. We spent our weekend barbeque-ing with our friends, watching the World Cup (Schland!) and enjoying some boozy drinks (two-finger wide Liquer 43 with milk - yum!). In a bowl combine the flour, eggs and olive oil. Knead the dough until it has come together and is smooth with a silky glow, if it's too wet add more flour and the other way round, if it's to crumbly add a little more oil. Divide it into 4 blocks, wrap it into cling film and chill for at least 30 minutes (or up to 2 days). 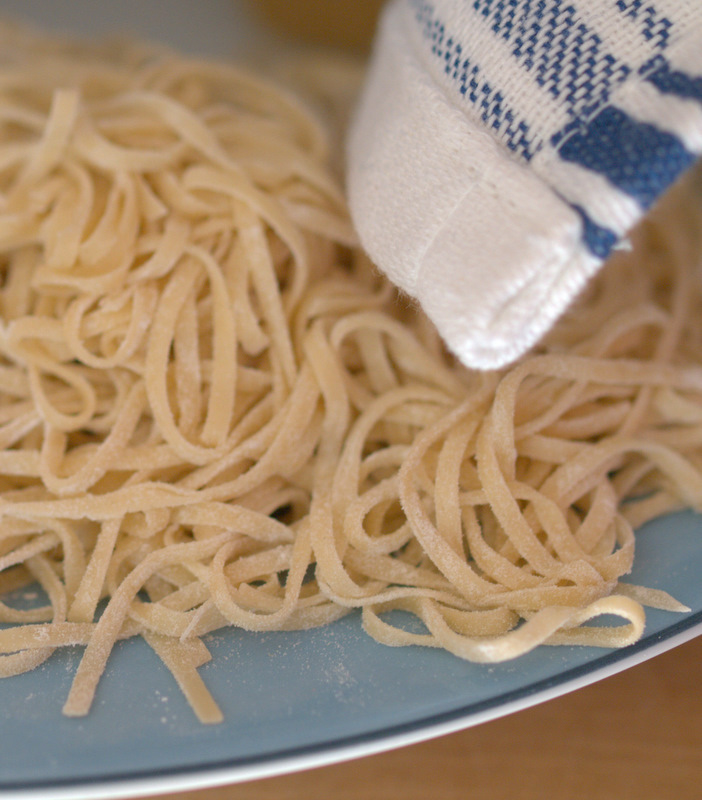 Dust your work surface with flour and set your pasta machine to the widest setting. Take one piece of the dough and flatten it on the floured surface with a rolling pin. 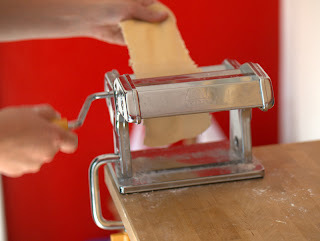 Pass the dough through the pasta machine, fold it one time and repeat at the same setting. Now narrow the setting and repeat. Go on until you get to the lowest setting. When each sheet is rolled, keep it under a moist towel so it won't dry out. For ravioli it's the best to make the dough as thin as possible, because the filling is the main character. Of course you can shape with this basic pasta dough every other shape you like. For thin spaghetti or tagliatelle I would stop a little earlier (maybe 7 from 9 possible settings). Heat a large pan over medium high heat and add the oil and garlic slices of one glove while still cool. So the oil has time to infuse with garlic flavor. Add the frozen spinach and cook until defrosted and the water is fully evaporated for around 10 minutes. Set aside and let it cool down a little. Transfer to a board and chop the spinach roughly. In a separate bowl combine the ricotta, 1 handful of parmesan and spinach, season to taste with salt and pepper. Transfer the prepared dough to a generously floured work surface. Use a pastry cutter or the rim of a glass (~ 6cm in diameter) to stamp out discs. Place a heaped teaspoon of filling in the centre of disc, brush the border with a little egg white and place the other pasta disc on top. 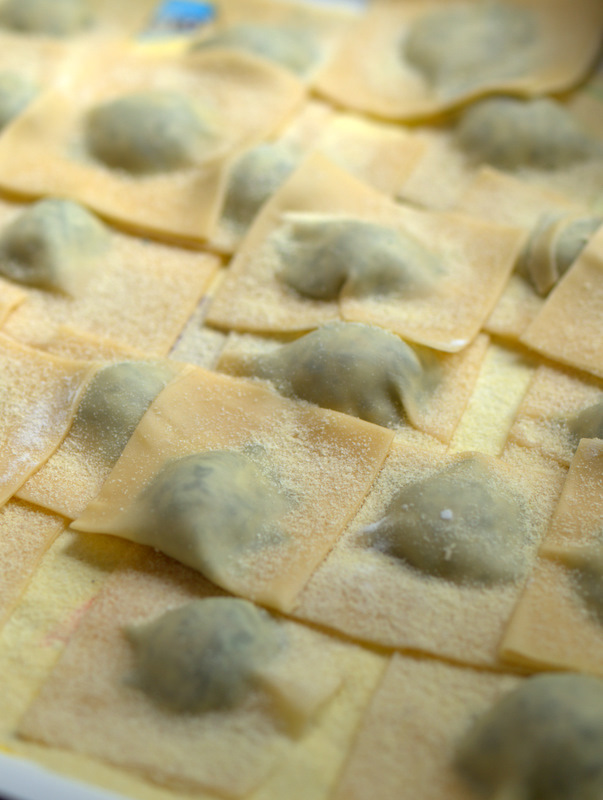 Gently press out any air as you seal the edges together firmly, unless the ravioli will burst in the cooking water. 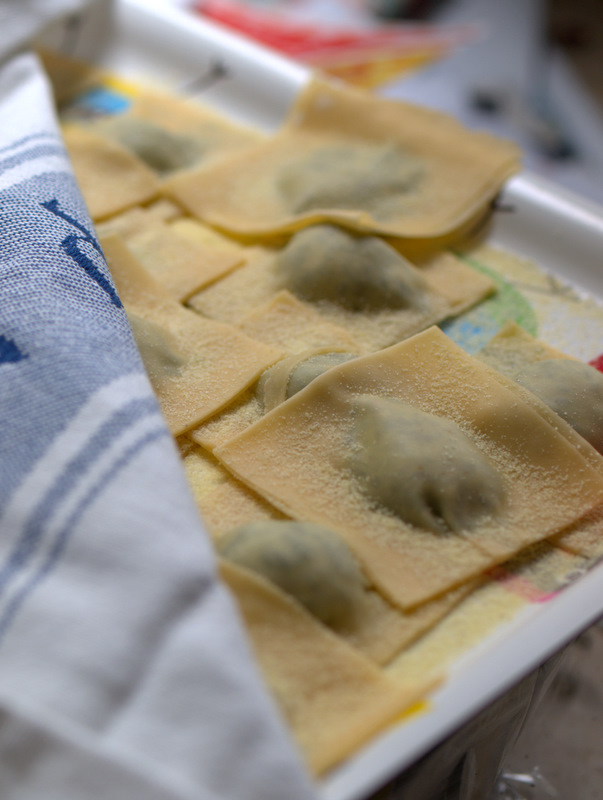 As they are made, place the ravioli on a tray or plate sprinkled with plenty of semolina. Leave it to dry for around 15 minutes. The ravioli can be stored covered with cling film up to a day in the fridge. In the meantime prepare the tomato sauce, see recipe below. Heat in a large pot salted water to the boil. Cook the pasta for 2-3 minutes or until al dente. Drain and retain some of the cooking water. Heat a pan over medium heat, add the oil and onions and cook until the onions are translucent. In the last minute add the sliced garlic. Add the tomatoes and let it simmer around 30 minutes until the sauce is rather thick and very aromatic. Remove from heat and stir in the remaining parmesan and the basil. 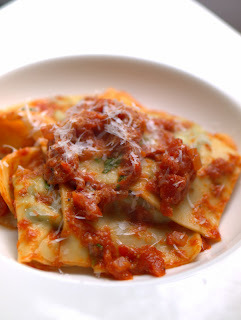 Season to taste, then stir in the cooked ravioli carefully. At this point you can adjust the thickness of the sauce by adding spoon by spoon of the reserved cooking water until preferred sauciness ;) Divide among the plates and serve with plenty of parmesan on top! During the jam making session with my friend Lisa I finally prepared this traditional australian dessert. It was about time! 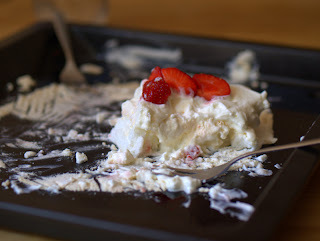 I don't know why, but back in december in Australia I didn't had the chance to try it but now, with 5 egg whites waiting in the fridge (leftovers from ice cream making ;) ) I jumped right into the adventure. Preheat the oven to 180°C (350F). In a greaseless bowl whisk the egg whites until they begin to thicken. Now add small amounts of sugar while stirring constantly until the sugar is incorporated and the egg whites form stiff peaks. It's perfect if you can turn the bowl around and the egg whites stay in it ;) Add starch and vinegar and whisk for a few seconds. 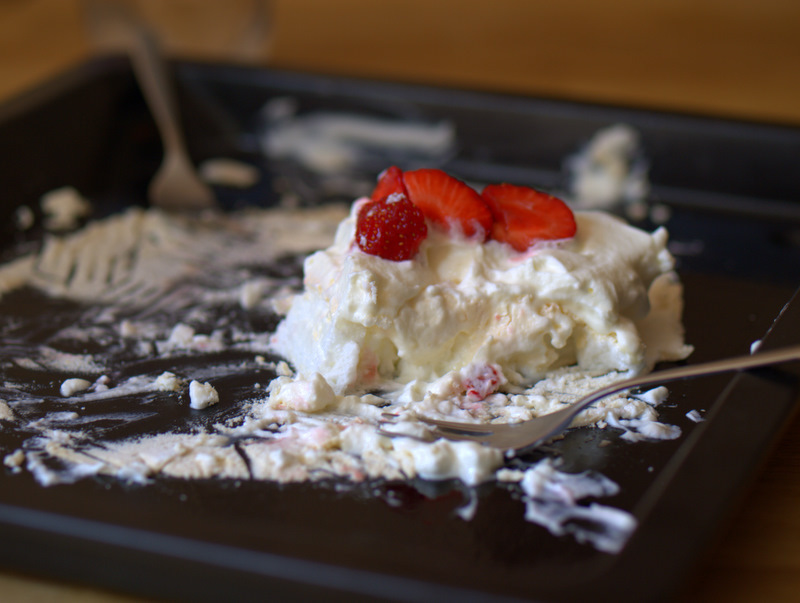 This mass is called meringue should have a silky gloss. Spread the mass onto a greased baking tray - it should be around 3cm thick with a roughly round shape and an even top. Slip it into the oven and decrease immediately the temperature from 180°C (350F) to 100°C (200F). 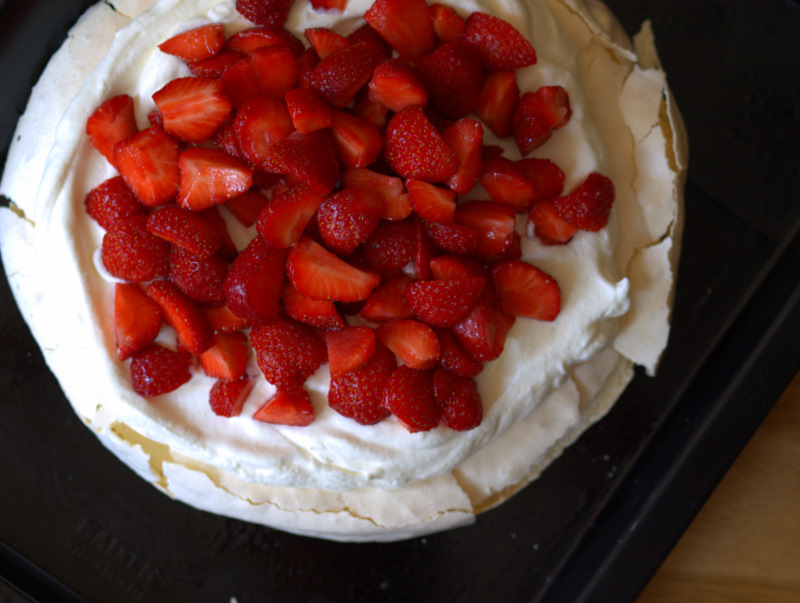 After an hour the meringue has hardened outside with a fluffy inside. For cooling down the pavlova just open the oven door and allow to cool until it has room temperature. 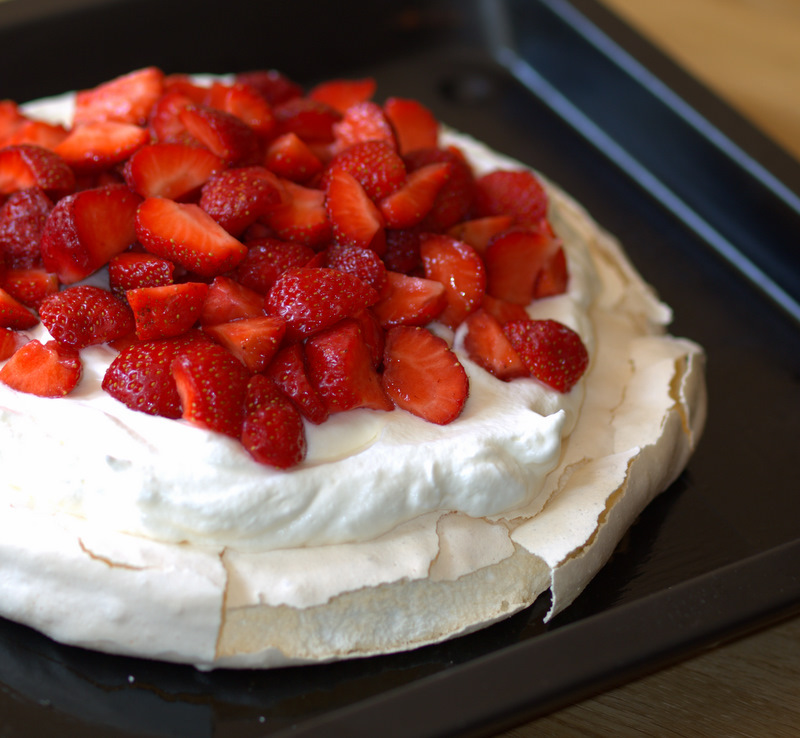 Whip the cream and spread carefully on top of the meringue. At least mount the strawberries on top.